by Nils Smith. Group Publishing , 2013. The dizzying array of social media outlets can send even the savviest congregation into a tailspin. Before that happens, grab this potent but brief resource from social media pastor Nils Smith. Smith’s social media and ministry savvy shine as he makes the case for social media as a viable and helpful congregational tool. 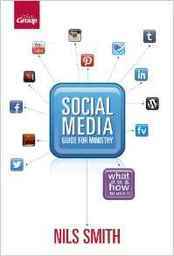 This helpful resource discusses numerous outlets, including Facebook, Pinterest, LinkedIn, Hashtags, and congregational web sites. Ministry tips are sprinkled throughout and include ways to connect the outlets with a specific ministry, ways to use the information Smith provides, and ways to enhance or simplify your current use of social media. The most frequent social media mistakes and the most frequent questions are offered. The appendix discusses marketing, advertising, copyrights, and more. This easily accessible and user-friendly resource is for any congregation seeking ways to improve or simplify its use of social media.